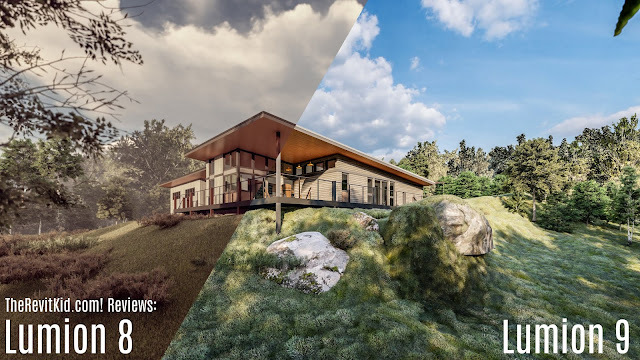 Lumion 9 Review - Real Skies, Real Grass, Real Problems...? A couple of things to note before you read my review of Lumion 9 to provide a little context and history. First, I have been an avid Lumion user and fan for over five years now. It has been, and continues to be, my main software for renderings and videos. Finally, be sure to read/view this entire review (especially the conclusion). When I review a software on the blog I have two rules: It must be a software that I have used to a significant capacity (ie. completed actual projects on it and had a chance to really “dig in”), and it must be an honest review (no holding back, even if the company offers me a “review copy”, etc…). Lumion has always had a decent looking built in sky. You have always had control over the clouds, brightness, horizon clouds, and even contrails. However, the sky didn’t influence the overall lighting of the scene the way it does in other programs (like V-Ray). To add to the already improved realism of Lumion 7 and 8, Lumion 9 introduced “Real Skies”. 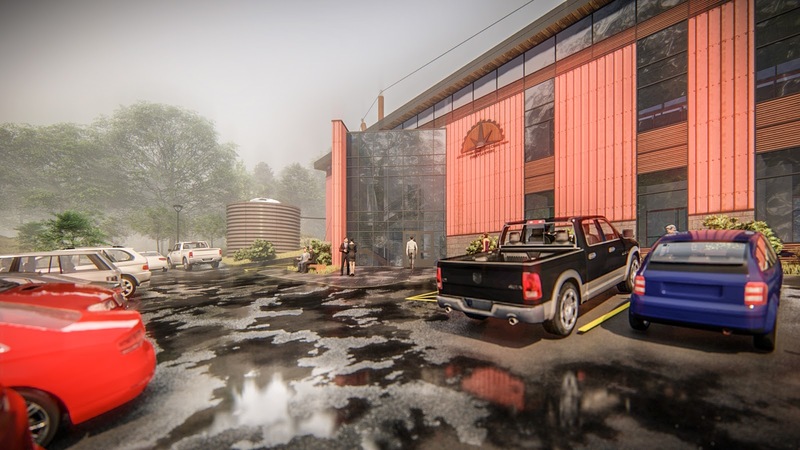 These are HDR skyboxes that dramatically improve and effect the overall lighting of your scenes. New Lumion 9 Grass on the Right, Old Lumion 8 Grass on the Left. One of the things that has always impressed me about Lumion is its ability to add 3D grass to the entire world without completely bogging down your machine. In previous versions you could apply 3D grass to “landscape” materials only and were limited to a few settings/color configurations. In Lumion 9, you have the ability to apply 3D grass as a material to any object, are given much more settings to modify the grass, and can load in your own texture (that also affects the overall coloring of the 3D grass blades). The results are impressive and, similar to Real Skies, gives that little something extra to your renderings. Adding Rain and Snow to a image or video scene in Lumion is nothing new, but the new “Precipitation Effect” has dramatically improved the use of weather in your scenes. The actual final rendering of a full snow and full rain scene hasn’t changed much besides more realistic “blocking” (for example, if it’s not snowing really hard there may not be snow at the base of a tree). There are two really neat things I discovered with the new Precipitation Effect. First, when you turn the rain up higher it creates puddles and wets the materials around the scene. These puddles and wet materials actually show rain droplets rippling the water. This subtle detail is a really nice touch. This type of scene is not as easily created in any other program. Lumion 9 introduces a new User Interface (UI). I have to be honest with you, I have been using Lumion intensely for over 5 years now and not once did I think the UI needed an update or modification… I am not sure where the developers got the idea that this was necessary. Another subtle function that was removed (although, I am not sure if this is because of the new UI) is the way you duplicate models. In Lumion, if you move and object (or selection of objects) and press “ALT” while moving you can duplicate our objects. Previously, the new objects would adhere to whatever model plane you place them on. For example, if you wanted to duplicate furniture onto another floor you could just use Move, Alt, and the models would jump up to the new level when you hovered over it. Now when you duplicate them they are constrained to the existing models planes. So you have to duplicate, place, select again, then move up to the new level… Not lean, in my opinion. 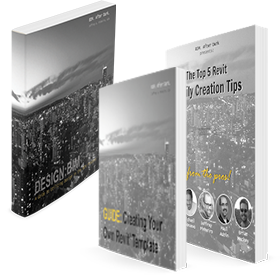 If Lumion 9 will be your first time ever using or learning the program you may not notice or care about these subtle changes. If you have been using Lumion for years in previous versions, they will drive you nuts. It is no surprise that most new software will require better hardware specs than the previous version. This is simply the nature of computers and software. That being said, Lumion 9 runs well on all of my PCs in almost all areas of the software except one: video creation. To clarify, video creation with certain effects. When creating animated videos in Lumion you create a “clip” with several camera keyframes. You then apply effects to that clip to add specific visual enhancements and to move objects. To make objects move you will use either the “Mass Move” effect, the “Move” effect, or the “Advanced Move” effect. For some reason, when you use one or two too many “Mass Movement” paths in your clips they become impossible to preview. This was never the case in previous version of Lumion. Speaking of “Move” effects. The last and final frustrating feature that has been modified in Lumion 9 is how Lumion handles your scene’s layer states when in build mode versus photo/video mode. To control what layers are visible or not in your Photo or Video clip you would apply a “Layer Visibility” effect. You are then able to turn layers on and off without affecting the build mode or other clips. This still works. The problem is, when you use effects that require object selections (such as Move, Variations, Mass Move, etc…) the selection view flips to the layer states of the Build mode. Lumion 9.0 was released in early November of last year. To be completely honest with you, I have been waiting to post this review in hopes that “The Bad” from above would be fixed by now (myself, and many others have expressed our opinions on the Lumion forums). There have been two updates to 9.0 since it’s release three months ago (9.0.2 is the most current version) and the issues I mentioned above still exist. If you are a brand new Lumion user and this will be your first purchase and use of the software then go for Lumion 9. You will get all the benefits of the new rendering features and you may not care about the functionality that has been removed (because you don’t know any better). 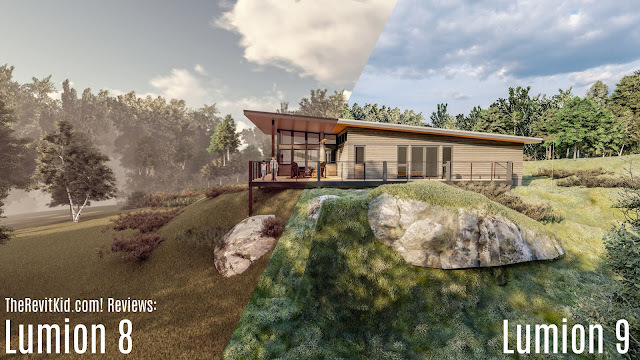 I am still a Lumion user and fan and will continue using the software for all of my renderings and videos. But, if you are on the fence about spending over $2000 for the new version, wait until you see my post on this blog (hopefully in the near future) exclaiming, “Hallelujah, they fixed these issues!”.